Creek Street on a quiet Sunday morning before the shops open. After a 36-hour ferry ride through the blue and green passage off the coast of British Columbia, past stunning fjords and accompanied by a few surfacing humpback whales, we arrived in Ketchikan early Sunday morning and after a quick look around Creek Street, the old red-light district built over Ketchikan Creek, we found pancakes at a diner before hiking to the Presbyterian Church. We’d contacted Rev. George Pasley on Facebook so he was looking out for us. A group of girl scouts was visiting too so we had a friendly worship and fellowship there followed by lunch with George. 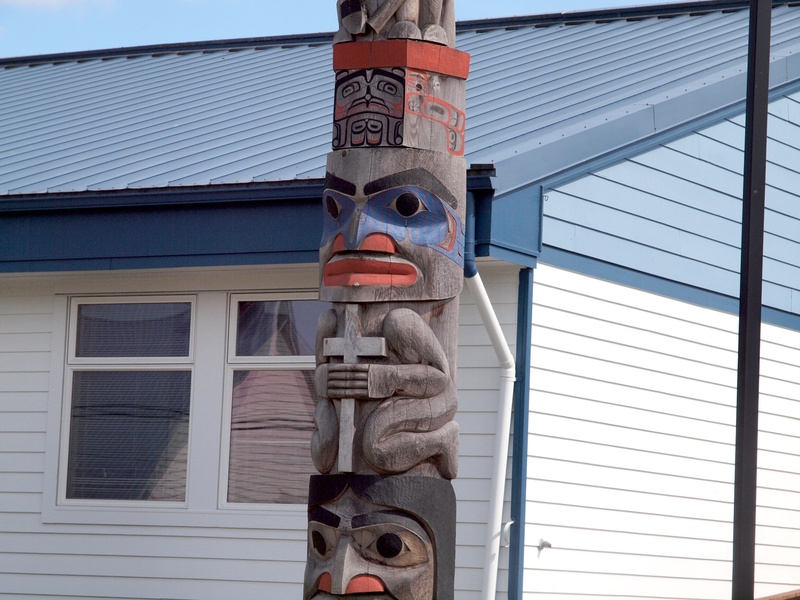 This Tlingit Tribe Pole on the Point at Totem Bight State Park near Ketchikan represents a shaman at the top dressed in a bear claw headdress and fringed leather apron. A halibut, two land otters, an eagle and frog are among the figures below him. In Ketchikan we didn’t find any native people to “listen” to but we spent a lot of time visiting the two fantastic totem pole parks there, resting and doing a little gift shopping. 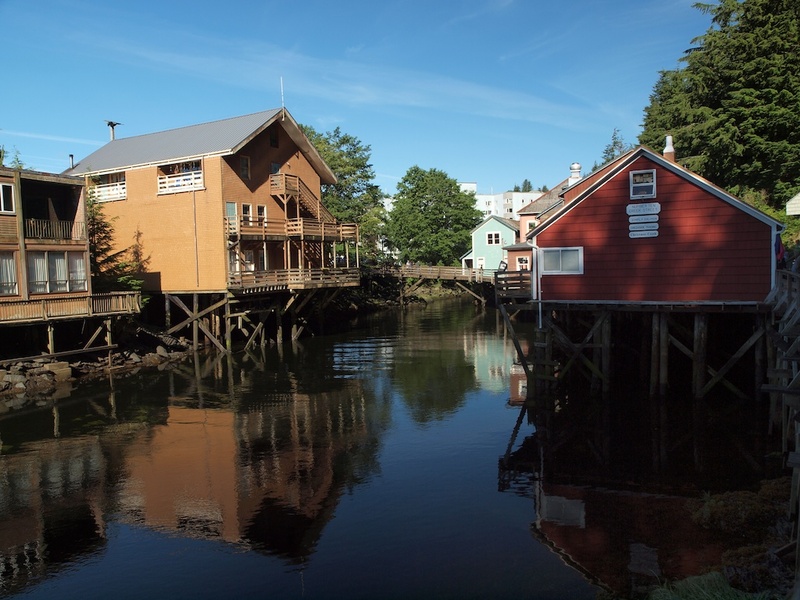 Downtown Ketchikan caters to the glamorous cruise ships from around the world that dock there, each one a floating city. Front Street, across the dock, is nearly all diamond dealers. In New Town, the part of town on the other side of a tunnel drilled through a rock with houses sitting on top, we took the bus and found a world of workers. We met many people who come from the Phillipines, Peru, Mexico and many American cities for the season to work in the canneries, for the ferries, contruction, restaurants and fishing. Another day we took a float plane (the first time for both of us) out to Annette Island, to visit the new Presbyterian pastor at Metlakatla, the only Indian reservation in Alaska. 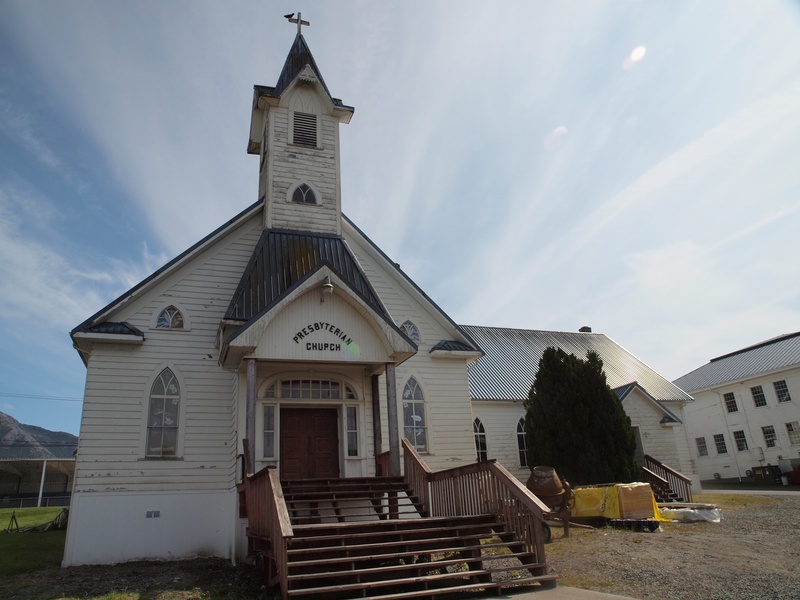 Tom Sutherland hadn’t been ordained yet, (he was a Commissioned Lay Pastor with the Nez Perce which was how we learned about him) and had just arrived on the island. We ate sushi complete with sea asparagus, kippered salmon and sea cucumber in a tiny restaurant near the harbor and watched some small boats put out their gill nets. 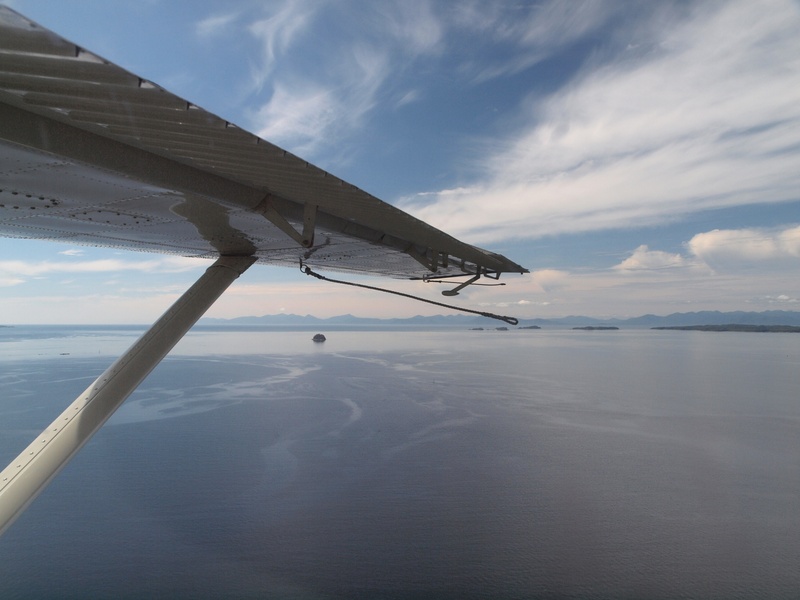 This is the view from the float plane that took us from Ketchikan to Metlakatla on Annette Island. Tom drove us around the small village and took us to see the church and then up to the hospital to meet an elder who works as a receptionist there. Elaine Guthrie explained the meaning of a small totem pole we had seen with a cross on it. She said it was made for her and two other women who retired from teaching native dances. Both George and Tom gave us valuable insights into the workings of Presbyterian mission in the area. This little totem at the school in Metlakatla was made to celebrate the work of three women including Presbyterian elder Elaine Guthrie who taught native dances to children for many years. Metlakatla Presbyterian Church founded in 1922 by Edward Marsden, the first North American Native ordained to preach in the U.S.
On our last day in Ketchikan we walked a little ways up Ketchikan Creek to watch the dog salmon spawning below the bridge. It was a thrilling and poignant sight to watch those noble fish returning to their birthplace to spawn, a trip they will make only once. 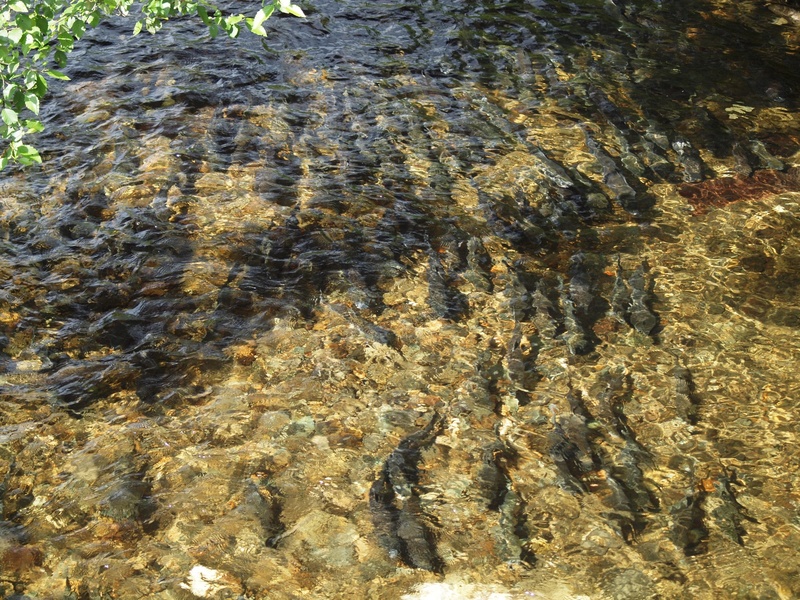 Look closely and you’ll see the hundreds of dog salmon swimming up Ketchikan Creek to spawn. Even as they are arriving they are already dying. Neighbors around there said all the dead salmon make a real stink. We had arrived just in time to see them but not smell them and as you can see from the pictures the weather that week was incredible. It didn’t start raining until we got to Sitka where we are now. It looks like rain for the next week. One difference between New Mexico and Alaska — raincoats and umbrellas. We bought ours to go to Scotland a few years ago. Here, when you hang up your raincoat to dry, it takes all day and an umbrella is your best friend once you get used to juggling it.